I enjoyed this exercise after the complexities of landscape. I used a dip pen and black ink to make a line drawing. I like the way the ink blobs a bit which can be used to reflect darker areas of shadow. To look at tone, I used turquoise ink and a brush. On one picture I also used masking fluid to make more detailed highlights. I also did a tonal drawing on grey paper using oiled charcoal and yellow chalk pastel. I enjoyed the opportunity to play around with some different materials while doing a fairly simple exercise. 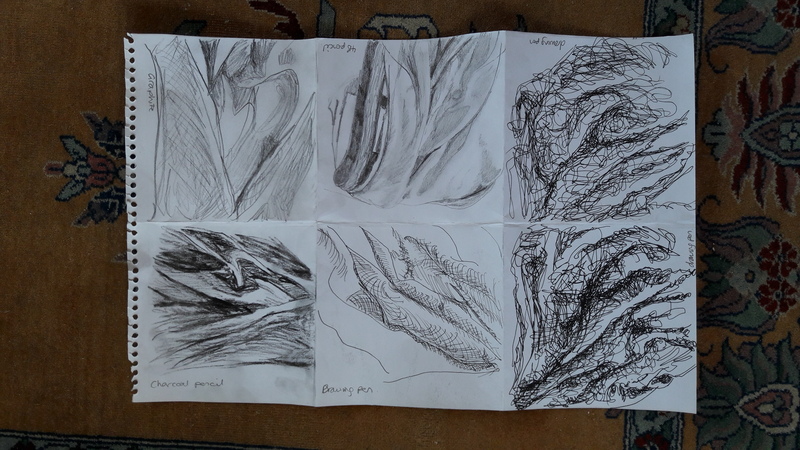 I followed this with 6 short (6 minute) sketches of folds in a blanket using drawing pen, charcoal pencil, graphite and 4b pencil. It was a useful exercise to explore different media.